After the highs of alliance partner Air New Zealand and the lows of opponent Qantas, Virgin Australia have today announced a "middle ground" position with their Half Year financial results. While still announcing a statutory after tax loss of $83.7M AUD in comparison with Qantas, Virgin are in no way a loser with this result. Virgin Australia has progressed with the integration of Skywest, continuing to align resources, systems and processes, and has worked closely with joint venture partner Tiger Airways Holdings Limited (Tigerair) to improve the performance of Tiger Airways Australia Pty Limited (Tigerair Australia). The integration of Skywest into the Virgin Australia Regional brand continues with this entity able to charter Virgin Australia jets to operate FIFO and other charter work especially in the WA mining areas. VA Regional will also take delivery of at least 6 new ATR 72-600 aircraft by the end of the 2015 Calendar year. Qantas have today announced their underlying half year loss of $252M AUD before tax, with an action plan that will see job losses, fleet changes, and sale of terminal leases. Qantas have announced that they have entered an agreement which will see the Brisbane Airport Corporation regain the lease of the Qantas Domestic terminal at Brisbane and related assets for $112M AUD. Over the next three years Qantas will reduce their workforce by 5000 full-time positions which will include a reduction of 1500 management and non-operational roles, a restructure of line maintenance, as well as the already announced closure of the Avalon maintenance base and Adelaide catering base. There will also be a reduction of operational roles relating to fleet and network changes, and the CNS flight crew base will close. Qantas will make a change in timing to their MEL-DXB-LHR services from November 2014 to reduce on ground timing of the A380 in LHR. Qantas will also end their PER-SIN services in first quarter FY15, while making all BNE-SIN and SYD-SIN services A330 replacing current B744 services. The 6 non-reconfigured Boeing 747-400 aircraft will be retired by the 2nd half of FY16 leaving just the 9 B744s with the A380 interior product. You can read the Qantas release to the ASX HERE and the Air New Zealand release to the NZX HERE, this story is also covered in almost every newspaper and website around. Qantas have rounded out the 737 'classic' era (737-300 & 400 models) with Boeing 737-476 VH-TJS named Jabiru flying the final service of the type on Sunday 23-February-2013 as QF819 CBR-MEL. VH-TJS was ordered by Australian Airlines and delivered new to them in early 1993 and was transferred to Qantas when the airline merged later that year. It has flown for the National airline ever since. While the retirement of VH-TJS and the Qantas Boeing 737-400 fleet see's the end of the era for the fleet on scheduled RPT service by the major carriers, the 737-300s & 400s continue to fly on in Australian skies. There are 11 737-300s and 2 737-400s that still regularly popup around the traps. Qantas subsidiary Express Freighters Australia (a former joint venture with Australia Post as Australian Air Express) operates a fleet of 4 Boeing 737-376(SF) in Qantas Freight colours, which cross the night skies flying freight between the Capital cities. All four of these aircraft flew with Qantas domestically and also with Jetconnect the New Zealand subsidiary of Qantas before being converted to freighters. Airwork NZ Limited operate a fleet of freighters in Australia on behalf of Toll Holdings this comprises 3x Boeing 737-3B7, 1x Boeing 737-3S1 & 1x Boeing 737-4Q8, these aircraft also fly in New Zealand. Airwork has a further Boeing 737-476 ZK-JTQ which operates in Australia on charter, recently for Alliance Airlines on FIFO work. This aircraft was also formerly Qantas & Jetconnect. The other carrier that keeps the 'classics' in the Australian skies is Air Nauru which operates a fleet of 3 aircraft on scheduled services to Nauru, as well as FIFO and government charter work. Blenheim businesses are celebrating with Air New Zealand's announcement that the BHE-AKL route will shift to all Dash 8 Q300 aircraft. Blenheim Shuttle owner Duncan McIntyre, who transports people to and from the airport, said increased passenger numbers would benefit a lot of Marlborough businesses. "It helps everyone," Mr McIntyre said. "Everybody wins. Anything that helps Marlborough is great." The flights currently operate 4x daily 2 utilising the Q300 and the other two with the staple Beech 1900D. 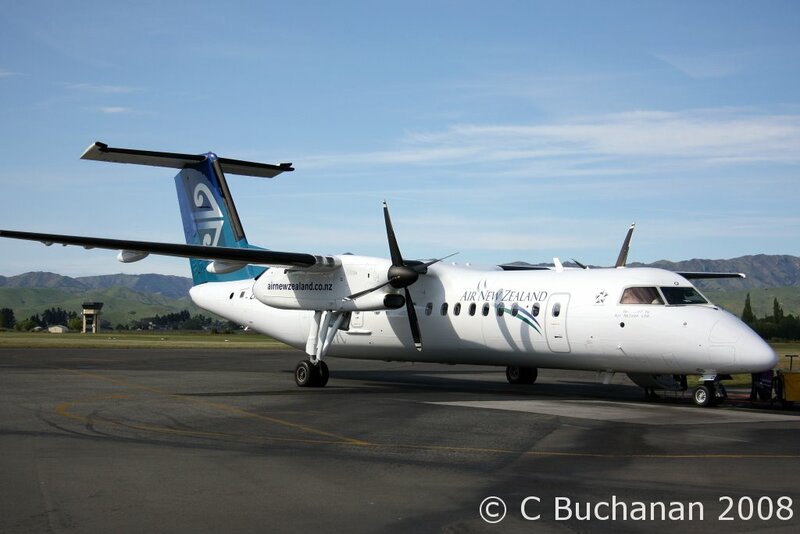 There are currently 5 flights on Friday's with an additional 1900D service, just 3 on Saturdays and 5 on Sunday's with one operated by Mt Cook with an ATR 72. From Next week Monday 10-February-2014 the flights shift to all Q300 aircraft with 4 flights daily Sun-Fri & 3 on Sat. However the 4th flight on Sunday's remains with the 1900D and there are a few changes over Feb to meet increased demand for events in Blenheim.